Baking at home can be exhausting, and most of the time your baked goods don't taste as good as the stuff you get at a bakery. So BuzzFeed Food talked to Kyle Bartone, pastry sous chef at Eataly in New York City, to see what baking tips and tricks he swears by. 1. For super moist cakes, get yourself a multi-nozzled squirt bottle (aka a soaker bottle). "For large sheet cakes and rounds," says Bartone, "we give them a quick showering of simple syrup or booze to keep them moist." Most bakeshops use special squirt bottles ($14.99 on Amazon) that have multiple nozzles or showerlike lids to evenly soak their cakes. This makes sure the cakes stay super moist and don't dry out after you cut them. 2. Let your cookie dough "ripen" at least 24 hours before you bake it. "Make your cookie dough and let it hang out in the fridge for a day or two," says Bartone. "This dries out the dough slightly, and yields a cookie that has a better flavor and texture." Don't believe him? The inventor of the chocolate chip cookie herself actually swore by resting her dough for a full 36 hours! 3. A bench scraper is your secret weapon for tackling just about anything. "In professional bakeries, bench scrapers are used for everything," says Bartone. Bench scrapers ($7.83 on Amazon) are a pastry chef's secret weapon for cleaning up, making perfectly smooth cakes, and portioning dough. 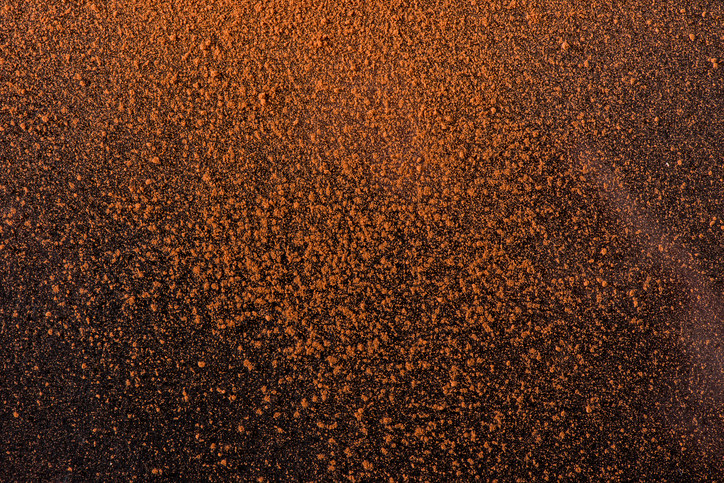 "I use my bench scraper more than anything else," says Bartone. "It just makes my job easier." 4. For chocolate doughs and batters, use cocoa powder instead of flour to prevent them from sticking on the counter or in their tins. "For any dough or batter that is chocolate flavored," explains Bartone, "I prefer to use unsweetened cocoa powder instead of flour when prepping my cake pans." Flour can add a dull appearance and dry mouthfeel, while cocoa powder simply adds more chocolate flavor (which is never a bad thing). Next time you make a chocolate cake, try buttering and dusting your pan with cocoa powder instead of flour to prevent it from sticking. 5. For more accurate baking, measure all of your ingredients by weight, not volume. Food scales ($10.49 on Amazon) are a pastry chef's best friend. Ask any professional baker how they measure ingredients, and they'll tell you by weight. "We don't measure anything by volume," explains Bartone. "It's inaccurate and leads to inconsistent results." Learn how to work with them here. 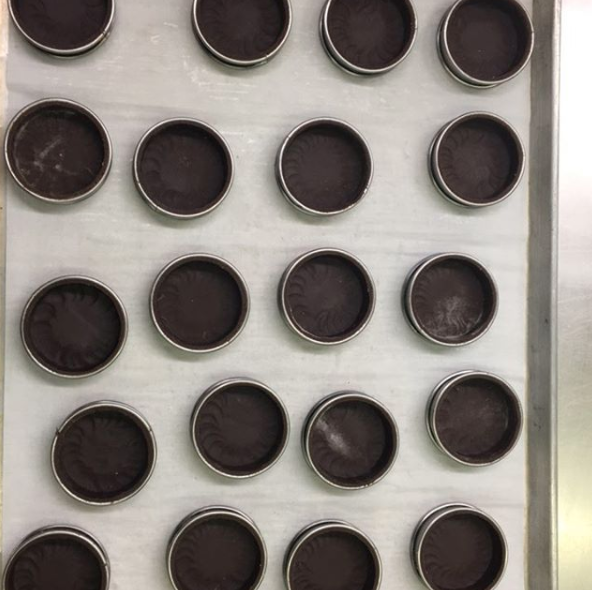 Cake pans are expensive, so pastry chefs use ring molds (like this set of two for $10.99) to make large batches of cakes that are the same size. For baking, simply place it on a sheet tray and bake batter directly in it. "Just make sure your sheet tray is completely flat," warns Bartone, "otherwise the batter can seep out." Ring molds can also be used to assemble desserts — just stack layers of cake, mousse, or frosting in them to keep things clean. Learn how to assemble fancy mousse cakes in them here. 7. Use acetate paper to make perfectly layered cakes and shiny chocolate garnishes. Acetate (like this stack of 25 sheets for $9.34) is a rigid sheet used in pastry kitchens for chocolate work and cake assembly. 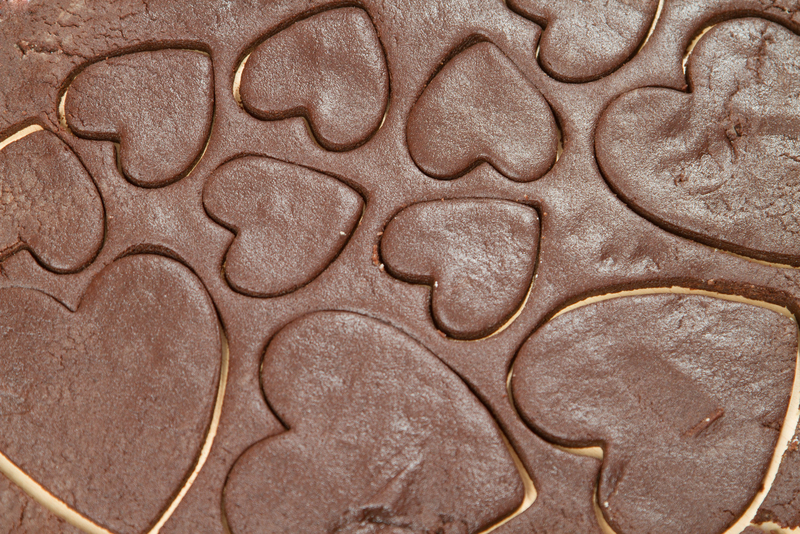 "I use acetate to create smooth and shiny chocolate decorations," says Bartone. "The chocolate turns out super shiny and is easy to peel off." 8. Russian piping tips can make anything look insanely fancy, but don't take much effort (or skill) to use. Russian piping tips (like this set of seven for $11.95) are a relatively new invention that help pastry chefs get intricate piping designs in one easy motion. 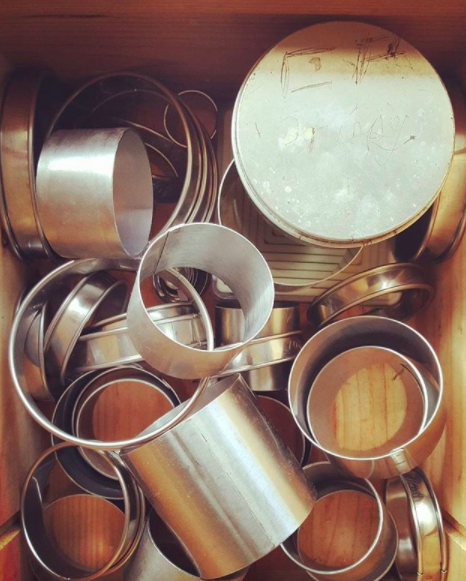 "They're not super common in professional bakeries yet," shares Bartone, "but I have seen them slowly make their way into bakeshops and I'm always excited to use them." 9. Use bubble tea straws to prevent your cakes from sliding. "If you're attempting to make a tall cake," shares Bartone, "it's going to need support. One way to do that is to stick bubble tea straws in the center and trim the tops." While some chefs use expensive plastic tubes or dowels, most professional pastry chefs use bubble tea straws (like this set of 40 for $5.29) to hold their cakes together. 10. Save money by making piping bags out of parchment paper instead of buying them. Also called cornets, these DIY pastry bags make piping chocolate and frosting a breeze. "For customers that request writing on their cake," shares Bartone, "I just fold up a quick cornet and use it to easily write on them without having to use a pastry bag." See how to do it here. 11. Invest in an oven thermometer to make sure you're baking at the proper temperature. "Ovens are almost never accurate and they can seriously mess up your baked goods," shares Bartone. To be safe, invest in an oven thermometer ($5.67 on Amazon). Just hang it off a rack in your oven to make sure your temperature is exactly where you need it. An oven that runs hot can make your cakes rise too quickly and fall, while an oven that is too cold can result in inadequate browning. 12. After you pour your cake batter into a pan, give it a few good taps and quickly spin it. 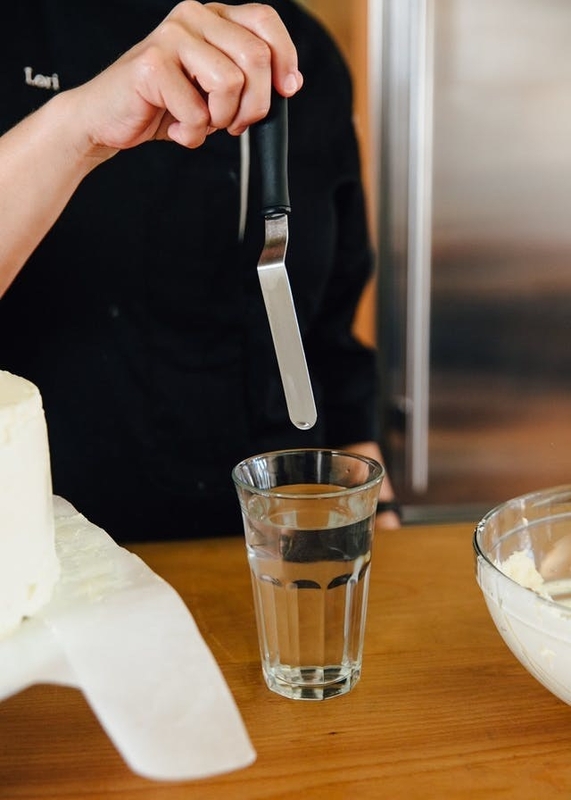 "After you pour cake batter into a pan," says Bartone, "tap it down several times and then quickly spin it so the batter rises up the sides slightly." This will get rid of any air bubbles and help the sides of the cake climb upwards and dome less. 13. Those little silica packets that come in electronics are perfect for keeping baked goods dry. 14. Pastry chefs don't always memorize their recipes, they just use equations. "I couldn't recite many recipes from memory," explains Bartone, "but I can tell you that pie dough is 3-2-1, choux pastry is 2-1-1-2, and so on." Memorizing standard ratios allow pastry chefs to whip up new creations without having to look at a recipe. If you know that a pound cake is simply a pound of every ingredient, you'll be able to make one without looking at a recipe. Learn more about using ratios here. 15. 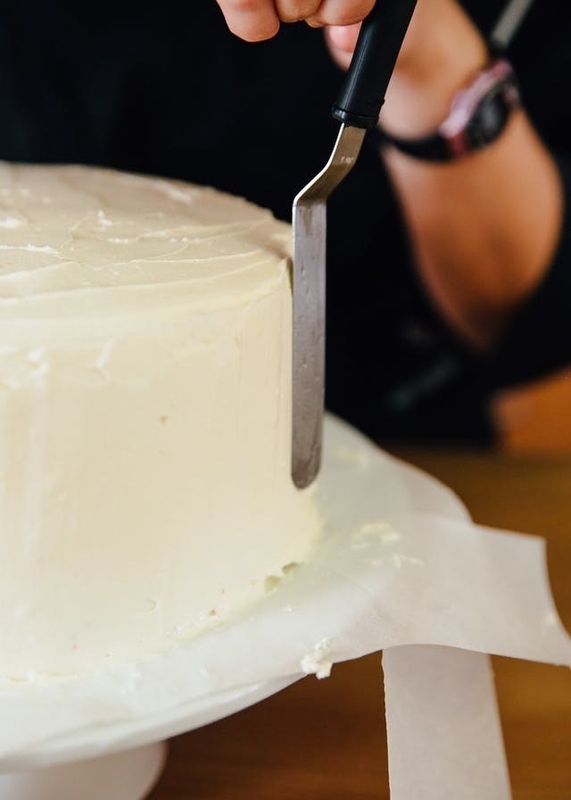 Heat up your tools before frosting a cake to create a super smooth finish. "To get buttercream super smooth," says Bartone, "I heat up my offset spatula with a blow torch for a few seconds. This helps the spatula glide over the frosting and smooth it out without melting it too much." If you don't have a blowtorch at home, you can just dip your spatula in hot water for a few seconds. Check out even more cake decorating tips here. 16. If you want to use real vanilla bean but don't want to pay for it, use vanilla bean powder. Real vanilla beans taste amazing, but a single bean can cost up to eight dollars! One way pastry chefs get around that is by using vanilla bean powder ($24.99 on Amazon). It's made by dehydrating vanilla and grinding the entire pod (not just the seeds). "We use it anytime we want a strong vanilla flavor but can't justify the cost of paste or beans," shares Bartone.